The Meredith Hindley program in the Council’s special “Spy Month” lineup is not just a matter of Casablanca and World War II history, it is a matter of taste, i.e., the traditional taste of a fabulous Moroccan dinner at Souk in Trinity Groves. 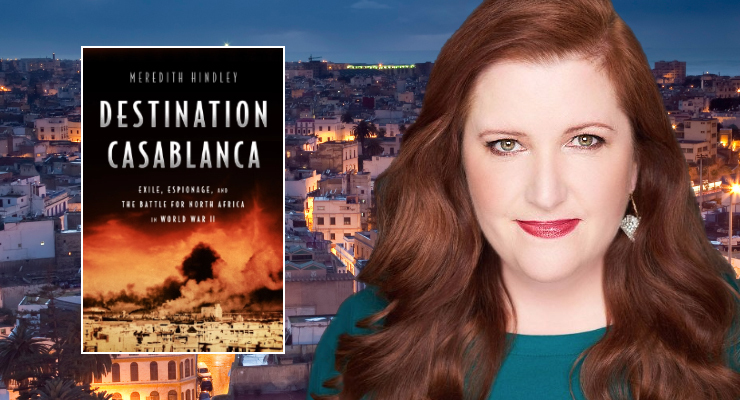 Join us with writer and historian Hindley, the author of Destination Casablanca: Exile, Espionage, and the Battle for North Africa in World War II. The book is a carefully documented revelation that there was more going on in the real Casablanca than just the fictional love story of filmdom’s Rick and Ilsa as the Nazis attempted to conquer the world. Casablanca, the Oscar winning film shot in Los Angeles in 1942, was fiction. In contrast, Hindley’s story of the Moroccan segment of the 1942 military effort, Operation Torch, examines the all-too-real mission of the Allied Forces violently reclaiming North African land from Hitler’s Third Reich. Hindley, raised in Colorado, earned bachelor’s degrees in English and history at the University of Wyoming and a master’s degree and a Ph.D. in history at American University in Washington, D.C., where she lives. She is a senior writer at Humanities. Her work has appeared in The New York Times, Lapham’s Quarterly, Barnes and Noble Review, Salon, Longreads and The Christian Science Monitor.